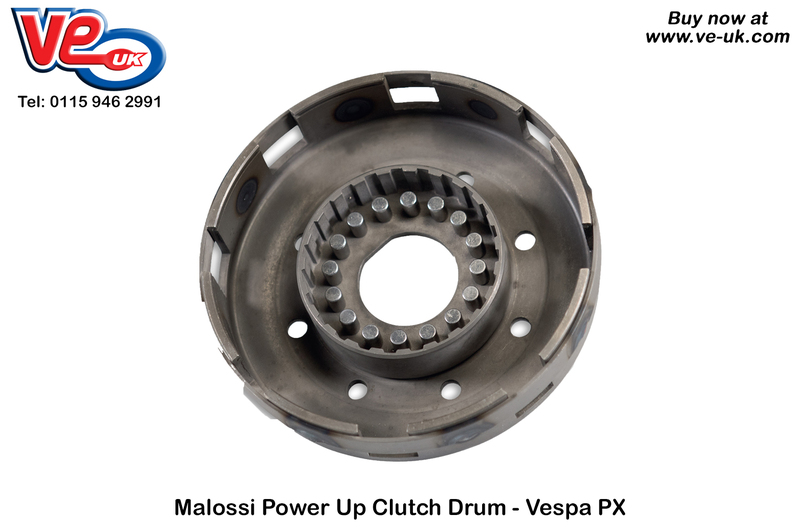 Upgrade your Vespa PX clutch drum to handle all the extra power from tuning modifications with this clutch drum by Malossi, available from VE (UK). The “Power Up” clutch drum has been developed to handle the increased power and torque found on heavily tuned PX scooters by fitting a reinforcement band around the circumference of the basket. The added band prevents the bell flexing due to centrifugal force under high revs ensuring more efficient operation. Furthermore the gear wheel is riveted to the basket using 16 rivets allowing up to 16 clutch springs to be installed so that the entire clutch can handle the increased torque and power. The clutch basket has also been lightened by adding cooling holes to help the clutch dissipate the increased clutch heat normally associated with heavily tuned scooters. This entry was posted in Malossi Performance, Vespa parts. Bookmark this page.